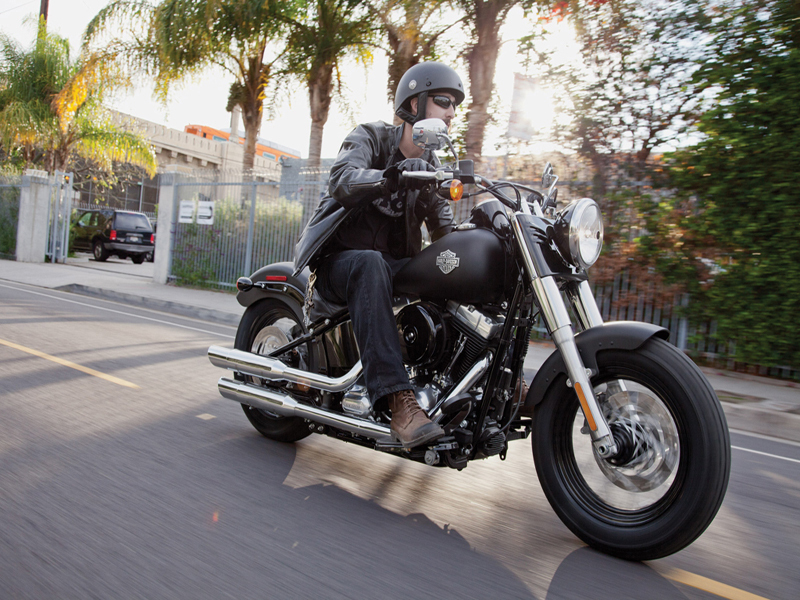 Harley Davidson Softail Slim is a cruiser bike for street ride with a plain and rough appearance. Read this review to find out its features, specifications and price in India. Harley Davidson Softail Slim is a cruiser made for powerful street ride and the bike has some design features that uplift the rugged nature of this bike. Starting from the black coated headlamp cover with a chrome rim, a stylish handle bar, front indicators mounted on the handle bar below the rear view mirrors, black coated engine fins and air filter with chrome plated engine head, chrome coated short gun type mufflers, solo low height large seat every bit of this bike makes it admirable. When all these features are coupled with some of the advanced technology from HD backyard a feast named Softail Slim is celebrated on road. The twin cam 103B engine of Softail Slim uses an air cooled system. The fuel injector adopted on this system delivers high efficiency with respect to time and performance by making use of an electronic unit that senses the injects charge into the cylinder based on turn of each cylinder. The 1690 cc capacity engine can deliver a maximum of 134 Nm torque at 3000 rpm. Engine uses 6 speed gear train to transfer the power that it generates to the wheels. Since the engine is capable of delivering high torques at low rpm the vibrations from the engine is relatively lower. 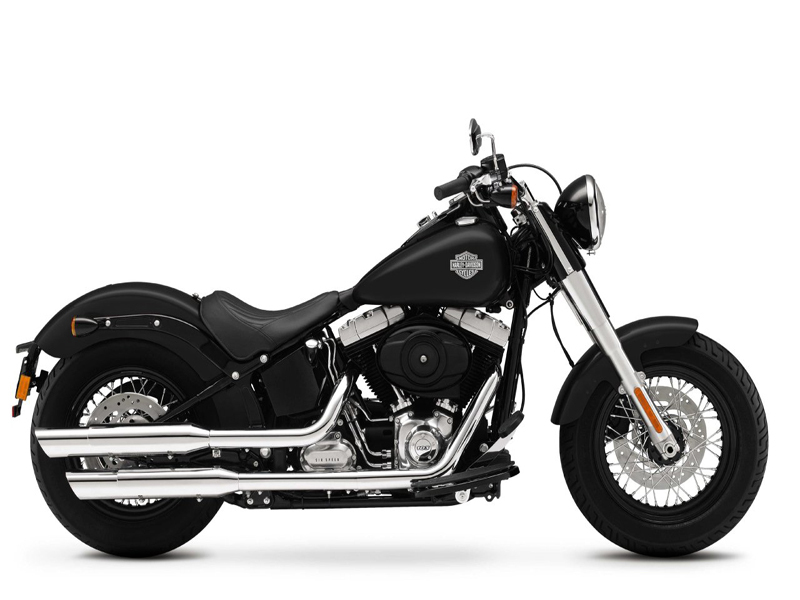 As the name indicates the Softail Slim model comes under the Softail category of Harley Davidson bikes that uses swingarm and hides the rear shocks beneath the rider side. It is a single seater bike that has a cross brace handle bar to bring back the looks of the good old days. The rider’s foot board is placed upfront and it is of the shape of a sliced fruit. The rear mud guard of this bike does not extend long unlike other bikes of Harley Davidson. It is cut short and covers a slim wheel (140 mm wide) to give a rugged look of this mean machine. The thick tire has special tread for better friction on front and the rear tire is comparatively slim to its counter parts. The tires are given a speed rating of 210 km/hr and are made of special rubber compound to give better control of ride. The Antilock Braking system on the bike with four piston caliper held disc brake on front and two piston caliper held disc brake on rear gives the rider better hold of this bike. The low seat height results in effective handling of the bike. The handle bar is at a slightly raised height when compared to the solo seat which keeps the riders back straight. The handle is slightly inclined and within the rider's reach making the rider's journey alike a King's reign on a throne. The bike is expected to give a mileage of the range 15 to 17 kms per liter of fuel and this may further depend on riding and road conditions. 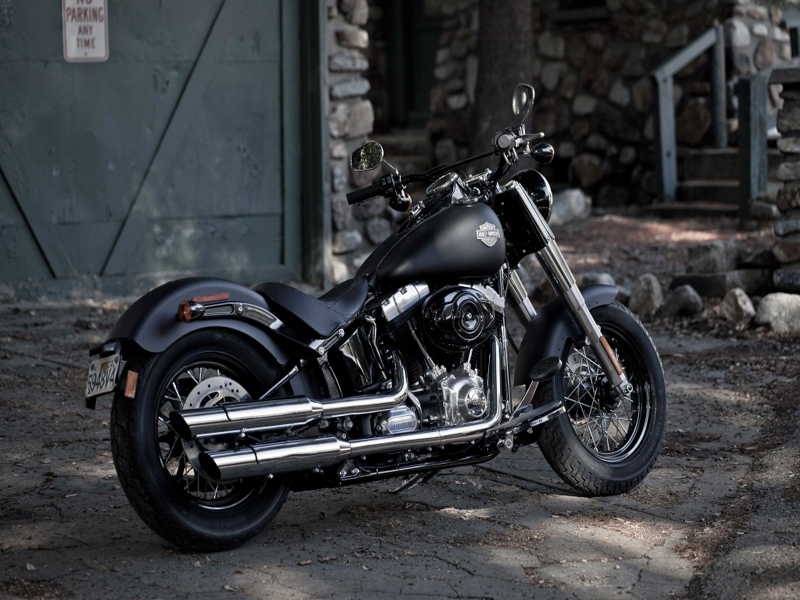 The Harley Davidson Softail Slim is available in Vivid Black, Black Denim an Ember Red Sung lo colors. The bike may have a price tag of Rs 22,00,000lakh as Ex-Showroom price.